Finally Google launched Google Calendar app for Android. Google Calendar previously available only selected models like Nexus S and Galaxy Nexus. Now it is available for all devices running Android 4.0.3 (ICS) (or) Jellybean. Google Calendar App shows events from each of your Google accounts that syncs with your Android devices. With this app you can create, edit and delete your events and also you can view all your calendar at the same time, including non Google calendars too. 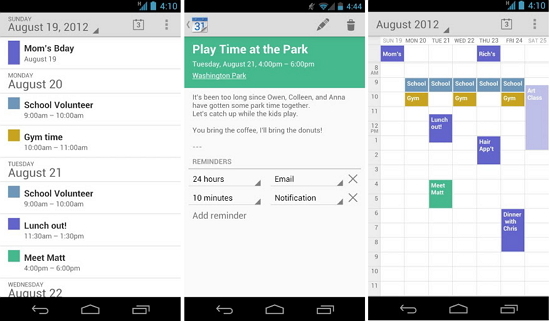 Google Calendar App is available free for Android from Google Play.